Report at 1600 hours at Safdarjung Railway Station for the check-in-formalities and leave directly for Jaipur at 1830 hours . Dinner will be provided on board at 1930 hours. Train reaches Sawai Madhopur Railway station at 0530AM and by 0600AM depart for early morning jungle safari to the adventurous Ranthambore National Park. After viewing the wildlife early morning breakfast will be provided in a forest lodge and by 1000AM return back to Palace on Wheels for onward journey to Chittorgarh and royal lunch will be provided onboard at 1300 hours. Popular for the tales of valour and romance of its erstwhile royalty, Chittorgarh was the former capital of the Sisodia clan of Mewar. Placed on the banks of rivers Gambhiri and Berach, this city has magnificent forts, ruined castles and glorious royal structures. Chittorgarh has a total of 7 huge entries. Train reaches Chittorgarh at 1600 hours and at 1630 hours depart for sightseeing tour to the Chittorgarh Fort and by 1800 hours evening tea and other refreshments will be provided at the cafeteria of Chittorgarh Fort accompanied by a beautiful light and sound show. Train reaches Udaipur at 0800AM and you will be provided with refreshing breakfast in a deluxe hotel .After breakfast at 0900AM depart for sightseeing of Udaipur City followed by A stately lunch in a heritage hotel at 1330 hours. 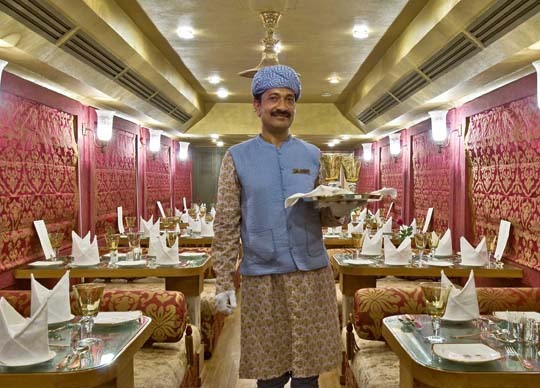 At 1430 hours boat ride in the lake Pichola and by 1500 hours return back to Railway Station for Evening Tea accompanied by refreshments onboard Palace on Wheels .Depart for Jaisalmer and by 1930 hours a deluxe dinner on board. Train reaches Jaisalmer at 0730AM and at 0915AM depart for sightseeing of Jaisalmer City, followed by Lunch at 1330 hours Lunch on the train or in a hotel. At 1530 depart for Tea and refreshments in the sand dunes of Jaisalmer along with a camel ride and later around 1930 hours enjoy royal dinner in the sand dunes accompanied by a colourful cultural program and by 2330 hours Return back to the train for an onward journey to Jodhpur. Train reaches at Jodhpur Railway Station at 0700AM and enjoy breakfast onboard and by 0900AM depart for sightseeing tour of Jodhpur City and after sightseeing at 1400 hours Lunch in a deluxe resort and by 1530 hours return back to the train for relaxing and a ride to Bharatpur followed by dinner onboard at 1930 hours. Early in the morning at 0500AM arrive Bharatpur and by 0600AM leave for Keoladeo Ghana National Park for an early morning bird viewing .After viewing enjoy breakfast in a deluxe lodge in the forest and by 0830AM return back to train for onwards journey to Agra at 0845AM. Train reaches Agra by 1030AM proceed first to visit UNESCO World Heritage Site of Agra Fort, seat of power of the mighty Mughal Empire. After lunch at ITC Mughal Hotel- Highlight of your journey is visit the Taj Mahal, one of seven wonders of modern world & a flawless architectural wonder built in white marble. Time free for shopping. Later return to train for onboard dinner & depart. 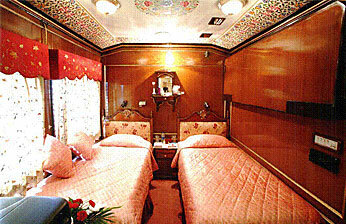 Train returns to Delhi Safdarjung Railway Station by 05:30AM and enjoy last breakfast on board by 07:15AM and farewell.